Enjoy this private Uffizi Gallery tour followed by a stroll around the artsy neighborhood of Oltrarno. 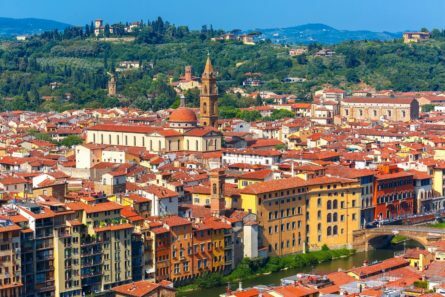 The “Oltrarno” – other side of the river Arno – is a lesser-known district of Florence full of craftsmen and ateliers and some of Florence’s finest Renaissance palaces. You’ll learn more about this lesser known part of Florence, before going to the Uffizi Gallery to admire world famous paintings by great masters. The left bank of the Arno River is known by Florentines as the Oltrarno, which translates to “the other side of the Arno.” In addition to be being rife with historical treasures, you will find many craft and artisan shops. Meet your private English speaking guide from Italy’s Best and enjoy a tour of a neighborhood that is quintessential Florence. As your guide leads you through the narrow streets of the Oltrarno, be sure to gaze up to see the medieval towers that once dominated the city’s skyline. Stroll through the Santo Spirito district and arrive at Santa Felicita Church, a treasure dating back to the second century then see the Agostinian Church of Santo Spirito, the last creation of the Renaissance Maestro Filippo Brunelleschi. To better understand the true essence of the “other Florence”, you will drop in on a local artisan and watch him or her at work before crossing the Ponte Vecchio once again to enjoy a private tour one of the world’s oldest and most famous art museums: the Uffizi Gallery. Situated in Florence’s historic center, the Uffizi Gallery is a former Medici palace that today displays a collection of paintings and sculptures ranging from medieval to modern. The gallery showcases works by many of Italy’s most renowned names in art including Giotto, da Vinci, Perugino, Michelangelo, Titian and Vasari and is famous for two of Botticelli’s most celebrated masterpieces; The Birth of Venus and The Primavera. Your private English-speaking guide will share the stories and legends of the art and architecture, allowing for a broad overview of Florentine Renaissance art. This luxury Rome to Florence sightseeing transfer via Orvieto in a Mercedes allows you to explore this quaint medieval Umbrian hill town.